You are limited to 100 GB in your /home volume. Space in the /data volumes is not unlimited. However, there is usually 1 TB of space available for any new data. Where can I store my data? Certain projects in SCCN have their own dedicated space. Please consult with your supervisors if you are uncertain where to store data. The temp location can be used to store files temporarily to be accessed by you or someone else, knowing that the files will exist for a limited time. IMPORTANT: Depending on the modification dates of the files, the files may be automatically deleted between one and 30 days of storing them in this location. Accessing the data locations are different depending on which operating system you are using. Open a My Documents window. Select View > Toolbars > Address Bar. Enter your SCCN username and password..
To create a shortcut to one of these locations after you get access to the shared folder, drag the icon in the far left of the address bar to your desktop or another folder window. 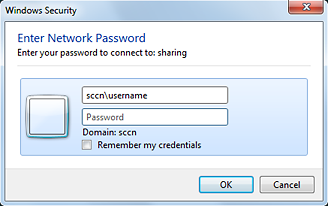 Enter your SCCN username and password. To create a bookmark to one of these locations, click the + to add it to the list.